Looking for some warm boots for the upcoming snow season? Here's a pair of boots that looks really, really warm. They offer boots for men, women, and kids. Value up to $195. One US based winner. Ends 12/16. Good luck. Welcome to the Heavenly Soles Boots Giveaway! Heavenly Soles is a new company selling the highest quality sheepskin boots. Heavenly Soles can make this claim due to the superior insoles and quality that their boots offer. The insoles are ergonomically correct, with an arch support, while the outsoles are made with rubber so they won't slip on ice or snow. Heavenly Soles are so sure that their boots are the best in the world, they offer a 100% money back guarantee. Girls, guys, even kids and babies can find a pair of boots that will fit and look great! You can find a full review from More Than Mommy. Heavenly Soles is generously giving away a pair of boots to one luck winner! This giveaway is open to residents of the U.S. 18 +. One entrant per household, please! *This blog has not been compensated for this giveaway and is not responsible for prize fulfillment. I learned their insoles are the world's first and have an arch support as well as a Gel heel all constructed around a memory foam base. learned that these boots sound so much better than ugg boots to me. They sell driving moccasins that won't slip on the pedals.They are also good for running errands. The outsoles do not slip in bad weather. I learned they have memory foam insoles with "Real" arch support, and a gel heel. The men's driving moccasins embrace your feet with moisture-wicking sheepskin covered with supple, leather. I learned that they have arch and heel support. I learned that the soles won't slip on ice which is important in MN!!!! I learned that Megan Fox is a fan of these boots. I learned that they have arch support, and they even make baby booties! I learned they make baby booty's , so cute ! I learned that Heavenly Soles are boots are better for your feet than popular brand name boots. I learned that the outsoles do not slip in bad weather. I learned these boots offer superior support. I learned "The outsoles do not slip in bad weather while the other brands are extremely slippery and dangerous." They have short and tall boots. I learned that if i am not 100% satisfied with your purchase, they will refund 100% of the purchase price. I learned that their style of boot dates back to the 1900's and was designed for its amazing comfort and is part of Australian heritage. They give all of their profits to charity. William H. Macy wears them. The insoles offer support, unlike many other boots. I learned that the arch support and durability is better than any other brand. I learned that the outsoles do not slip in bad weather, which is pretty convenient. I learned that all Heavenly Soles insoles are ergonomically correct! I learned the outsoles do not slip in bad weather while the other brands are extremely slippery and dangerous. These boots have an arch support as well as a gel heel, sounds so comfortable! I learned that their profits go to charities to benefit underprivileged kids. Didn't know such an organization existed-very impressed!! Going back later and see what their affiliate program is about. I think it's so cool what they're doing. 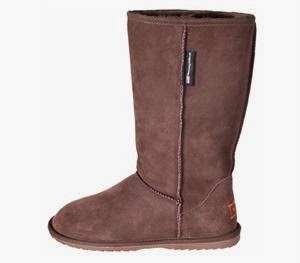 the sheepskin boots are high quality! I like that they are non slip. I have slipped on the ice every year taking my kids to school. It's cool that they have driving mocs. I learned that their outsoles do not slip in bad weather, while other boots can be extremely slippery and dangerous. Thank you for the super giveaway opportunity. Keep up the terrific blogging. I learned that Heavenly Soles makes some pretty stylish and comfy looking books and I need a pair!!! They have no slip outsoles. I learned they have been making boots since 1964 and sheepskin boots have been worn in Australia for over a hundred yrs. I learned they are better for your feet than other brands. I learned of features such as "Real" Rubber soles, removable, replaceable, memory foam insoles with "Real" arch support, and a gel heel. I love the fact that the insole are ergonomically correct! And they look great. I learned that the Heavenly Soles insoles have an arch support as well as a gel heel all constructed around a memory foam base. I learned they will refund your purchase price 100% if you are not satisfied with your boots. Because their insoles are egonomically correct, providing proper support! I learned that the outsoles are non slip! I love that they have non slip soles! I learned 100% of profits go to charity. Heavenly Soles donates all profits to charities that aid different segments of the population. 100% of profit goes to charities! All Heavenly Soles insoles are ergonomically correct and provide the proper support for young, growing feet while other brands continue to get poor reviews from podiatrists for their lack of support and potential damage that their products cause. I learned that dating back as far as the early 1900's, this style of boot was developed for it's amazing comfort and magical wool properties. awesome their proceeds go to helping children that are in need. I learned their boots are perfect for everyday wear: after work, running errands, to the movies, traveling or just for hanging around the house. Nice boots. Thanks for the contest. I learned that Heavenly Soles represents the pinnacle of this classic Aussie style and incorporates many unique features such as "Real" Rubber sole.